Kansas finances have come to a tragically grim place. The official estimate of revenue for this fiscal year has just been revised sharply downward, and brand new forecasts for FY 2018 and FY 2019 show a meager, unworkable revenue stream. This new information means that lawmakers must immediately cut $340 million from the current budget, just to keep the general fund barely solvent. 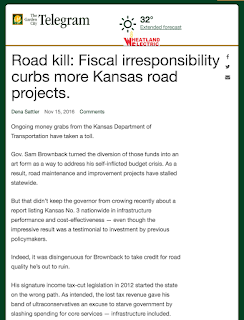 The cause of this disaster traces straight back to the Brownback income tax cuts of 2012. After implementation, income tax receipts fell $700 million, from $2.9 billion in FY 2013 to $2.2 billion in FY 2014, and never recovered. Now, the new revenue estimate forecasts that same $2.2 to $2.3 billion level of income tax receipts all the way through FY 2019. A huge swath of revenue that Kansas formerly depended on to pay bills has simply disappeared. As a result, for the fourth year in a row, Kansas does not have nearly enough revenue to pay bills. This year, though, the situation is dire because lawmakers have already used up all of the reserves ($709 million at the beginning of FY 2014), and tapped out the highway fund, leaving little flexibility. Plus, the governor earlier applied deep emergency budget cuts to state agencies, higher education, and Medicaid providers. Even so, another $340 million must somehow go before June 30. Public education and every other state service stand in serious danger. This problem will not heal on its own. Without corrective action, things only get worse in FY 2018. 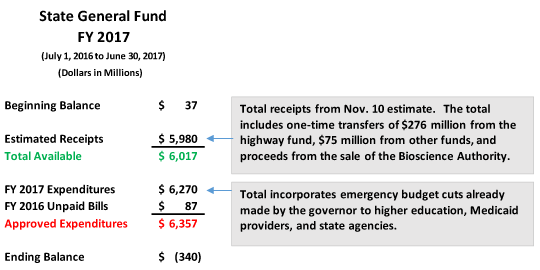 In this current fiscal year Kansas expenses are pegged at about $6.3 billion, and that’s a constrained set of expenses with emergency spending reductions already baked in. In FY 2018 expenses will only grow: Estimators have already predicted that Medicaid costs will rise $30 million. A $100 million retirement system payment (an unpaid bill from FY 2016) comes due. A Supreme Court decision on education looms. And problems exist throughout state government from years of cutbacks and constraints. So what’s the new forecast for total revenue in FY 2018? $5.5 billion. And in FY 2019? $5.5 billion. Even if expenses do not go up a dime from current levels, a completely unrealistic assumption, Kansas revenue is $800 million off the mark in FY 2018 and again in FY 2019. Kansans, we have to fix this! We have to stop the bleeding and reform our tax structure. We have to start now. The serious damage from the 2012 tax policy deepens every day.